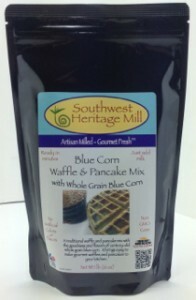 Blue Corn Pancake and Waffle Mix made with Whole Grain & Non GMO Corn. A delicious waffle mix that uses the flavors of century old blue corn. Just add eggs and milk or buttermilk. Ready in minutes.